Possibly the only thing shared between Spike Milligan and Peter Ackroyd is that they have both published their own take on the Frankenstein story. I’ve not read the Milligan version, but I think I’m safe in assuming that the only similarities with Ackroyd’s The Casebook of Victor Frankenstein are the bare bones of the story, something familiar to as all via Mary Shelley’s novel or Universal and Hammer film adaptations. I’m confident in this assumption – in no way do I imagine Peter Ackroyd as the missing fifth Goon. Ackroyd remains faithful to Shelley’s framework in his re imagining, embellishing the story with an exploration of the young Victor Frankenstein’s thirst to study anatomy. There are vivid descriptions of 19th century scientific experimentation; the attempts at reviving cadavers with electricity, the dark London inns where Frankenstein seeks out the services of the Resurrection men, the dangerous underworld types who will bring him fresh corpses to work on. His knowledge and love for London unquestionable, Ackroyd writes about the city with relish. It’s a convincing and very fascinating world to dip into. The Casebook of Victor Frankenstein also makes Mary Shelley one of its cast, along with Bysshe Shelley, although this is a conceit that sometimes sits at odds with the thrust of the narrative. But all in all the novel is a fine addition to the Frankenstein canon. And it already has its successors; Danny Boyle’s stage version is currently playing. Interestingly, the duality between Victor Frankenstein and his monster is explored in Boyle’s version, where the two lead actors alternate the roles, and Ackroyd does something similar, exploiting the link between creator and creation and offering an unusual, and quite shocking, conclusion. There is a dusty title on my shelf at home called Phantom Britain. Published in 1975, Marc Alexander’s book collects several accounts of ghost sightings and tales from across the country. There are many such collections as this, dating back no doubt through the centuries. 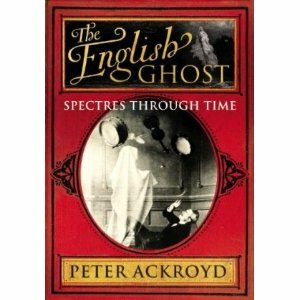 In The English Ghost: Spectres Through Time Peter Ackroyd brings together the best of such real life ghost stories. Ackroyd’s collection is one of the best I’ve seen of this type. His research appears very thorough and the only criticism is that too many of these eyewitness accounts of haunted houses, poltergeists, ghostly dogs and possessions date from before the 20th century. They are interesting to read, but their attention to detail and matter-of-factness make them resemble the fictional spooky tales that followed them, in particular those from the late Victorian era. Such close similarity to what most readers take as pure fancy may dull the effect of these supposedly true recollections. I had had that feeling for some minutes, when I saw at the foot of the bed a child, about seven or nine years old. The child seemed as if it were on the bed, and came gliding towards me as I lay. It was the figure of a little girl in her nightdress – a little girl with dark hair and a very white face. I tried to speak to her but could not. She came slowly on up to the top of the bed, and then I saw her face clearly. She seemed in great trouble; her hands were clasped and her eyes were turned up with a look of entreaty, an almost agonised look. Then, slowly unclasping her hands, she touched me on the shoulder. The hand felt icy cold, and while I strove to speak she was gone. The bulk of these tales are brief and often inconsequential, and what fascinates in many is the insight into bygone times. However the best in my opinion were the more recent eye-witness accounts, such as the stories of phantom hitch-hikers and unexplained happenings on dark and deserted byways. The hauntings of Blue Bell Hill in the 60s and 70s are brilliantly creepy, as is the account of the Phantom of the A38. More contemporary phenomena like this would have make The English Ghost even more essential reading. Rather than the inspiration for ghost stories, these are the beginnings of the modern urban myth, which perhaps deserve a volume of their own.